The Public Services Card: what's the big deal? The Irish Council for Civil Liberties (ICCL) has warmly welcomed the strong focus on human rights in the report of the Commission on the Future of Policing (CFP), particularly its First Principle that, “Human Rights are the foundation and purpose of policing”. Our submission to the CFP in January 2018 called for respect for human rights to be the grounding principle of Garda reform, and indeed such an approach has been a priority for ICCL for many years. There are four areas of this report which we believe are warrant particular attention, namely: policing functions, accountability, national security, and implementation. “The emphasis on human rights in the Commission’s report marks a sea-change in how we understand policing in Ireland. We believe the vision outlined in the report, if implemented, will support a radical reform process which can deliver the changes needed in An Garda Síochána. The CFP report calls for a radical shift in how Gardaí understand their role and how the organisation itself is oriented. it places a welcome emphasis on community-based policing and partnerships, and on supporting Garda employees in their work and ensuring diversity within the organisation. ICCL welcomes the recommendations for ongoing human rights training, as well as the call for a review of the Garda discipline rules and procedures in order to better incorporate the Garda Code of Ethics. 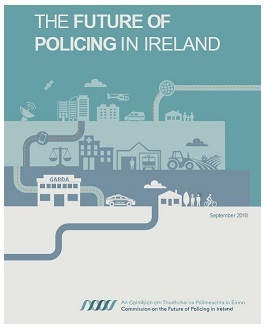 Throughout the report, there is a commitment to clarify the role of the police, and focusing on the front-line and community functions of the Garda. The CFP’s recommendations that Gardaí should withdraw from prosecuting crimes, controlling immigration, serving warrants and providing prison escorts are all highly significant in this regard. These measures will vastly improve relations between Gardaí and disadvantaged communities they work with. Accountability is a welcome focus of the CFP report. ICCL agrees with the CFP that the new Policing and Community Safety Oversight Commission (PCSOC) should have a Human Rights Adviser to assist its work. We will be calling on the Government to give this independent body strong statutory powers of inspection, including unannounced inspection, as a way of implementing the State’s legal obligations to protect the rights of people who are deprived of their liberty in all settings. We also believe that the PCSOC’s functions should include the regular publication of data relating to policing operations as well as crime. For example, disaggregated statistics should be published regularly on the Gardaí’s use of force and Stop and Search powers. We are very glad to see the CFP’s recommendation that the body that replaces GSOC – the Independent Office of the Police Ombudsman (IOPO) – should independently investigate all complaints falling within its remit, with no recourse to Garda investigators. The CFP has rightly called for greater clarity and coherence in the area of national security operations. ICCL welcomes the recommendation for a ‘comprehensive and robust review of the legislative framework’. We believe that the creation of a national Strategic Threat Analysis Centre (STAC) would be a step towards ensuring that national security operations are accountable to the public and the rule of law, in that the public would hopefully gain from it a clearer understanding of who participates in national security operations and what they do. However, national security policing still needs to be subject to robust independent oversight. This area of policing is not exempt from the State’s human rights obligations. Our recently commissioned report by Alyson Kilpatrick BL describes how independent oversight of the STAC’s activities could be achieved. That report also recommends that the Independent Reviewer of STAC has a human rights advisor and sufficient technical expert support. Perhaps the most important chapter of this report is the final one which calls for a robust implementation structure be put in place to ensure that these recommendations are given effect over a fixed timeline of three years. Given the plethora of reports on Garda reform over the years, this may be where this report will stand out from the crowd. ICCL has consistently highlighted that public trust in policing, and the effectiveness of policing, were transformed in Northern Ireland following the Good Friday Agreement through a rights-based approach. Last week the ICCL published a report setting out how human rights-based policing can be implemented in practice, authored by Alyson Kilpatrick BL who acted as Independent Human Rights Advisor to the Northern Ireland Policing Board for over seven years.